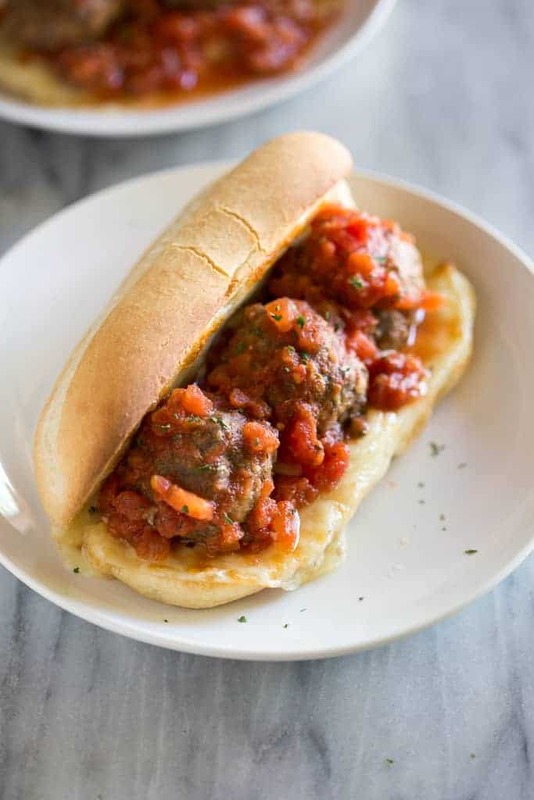 Easy Italian Meatball Subs with homemade meatballs, baked and topped with a simple Italian marinara sauce on a toasted bun with melted cheese!. My husband would quickly tell you this is his favorite meal I make. That’s high praise from a man who’s been taste-tester to hundreds of recipes I’ve made and shared here. They really are that good! I like to serve meatball subs with a vegetable, or salad like this Classic Wedge Salad and a fresh fruit bowl. 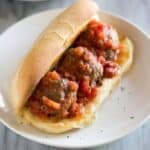 I couldn’t tell you which is better in this recipe, the homemade meatballs, or the homemade meatball sub sauce! Both are super easy and fast to make, and both taste amazing!! Both can also be made in advance and stored in the fridge, or made as a freezer meal. In a large bowl combine the saltine crackers, beef broth, egg, and spices (everything EXCEPT for the meat and flour). Stir and rest for 10 minutes so the crackers can soak up the liquid. Add the ground meat and mix just until combined (don’t over mix). Form 15 meatballs, dredge them lightly in flour and place them on a lined baking sheet. Bake meatballs or 20 -25 minutes or until cooked through. Add crushed tomatoes, oregano, basil, sugar, and garlic salt to a saucepan and stir to combine. Make the meatballs. Mix all ingredients for Italian meatballs. Roll into small balls, dredge lightly in flour, and bake. Make the sauce. Add all ingredients for the sauce to a saucepan and simmer for 15 minutes. Prep the bun. Slice the hoagie in half and top with provolone cheese. Broil. Broil on high for 2-3 minutes or until rolls are toasted and cheese is melted. Remove from oven. Assemble. Place 3 meatballs on each sub, followed by a large spoonful of sauce. Serve immediately. One of my favorite things about this recipe is that it’s totally freezer friendly. I like to make a big batch of the meatballs and freeze half of them after they’re baked. You could even freeze the sauce if you wanted. You can freeze meatballs when they are raw or after they are cooked. I like to cook them first (or at least brown them on the outside before freezing them. This makes them super fast and easy to work with when you want to reheat them. The meatballs and sauce freeze great. Store both in freezer-safe containers for up to 3 months. Can you freeze cooked meatballs? Yes. To freeze cooked meatballs, allow them to cool completely after baking, then store them in a gallon freezer ziplock bag. Store them in the freezer for up to 3 months. To thaw, refrigerate overnight or microwave the sauce and pour over frozen meatballs in a skillet. Heat until the meatballs are warmed through. Can you freeze raw meatballs? Yes. You can freeze raw meatballs for up to 3 months in the freezer. After making the meatballs and assembling them into small balls, store them in a freezer container or ziplock bag. 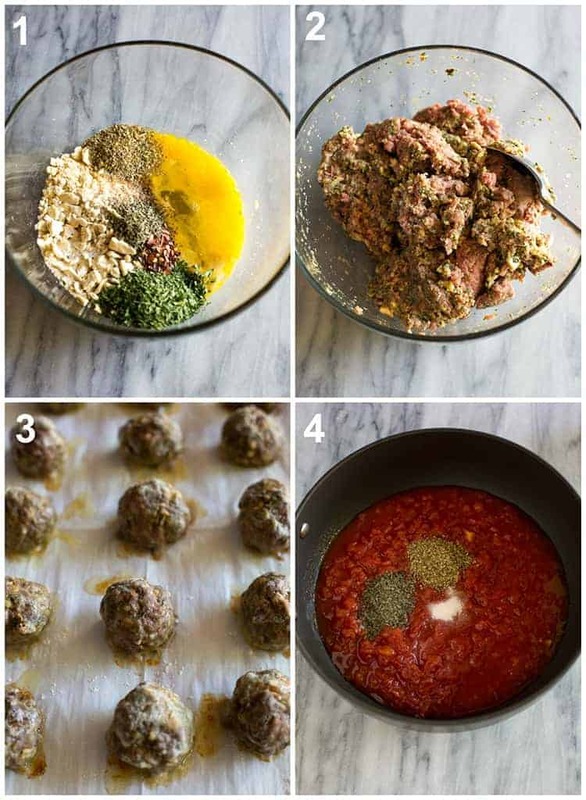 To thaw, refrigerate the meatballs overnight, before baking. 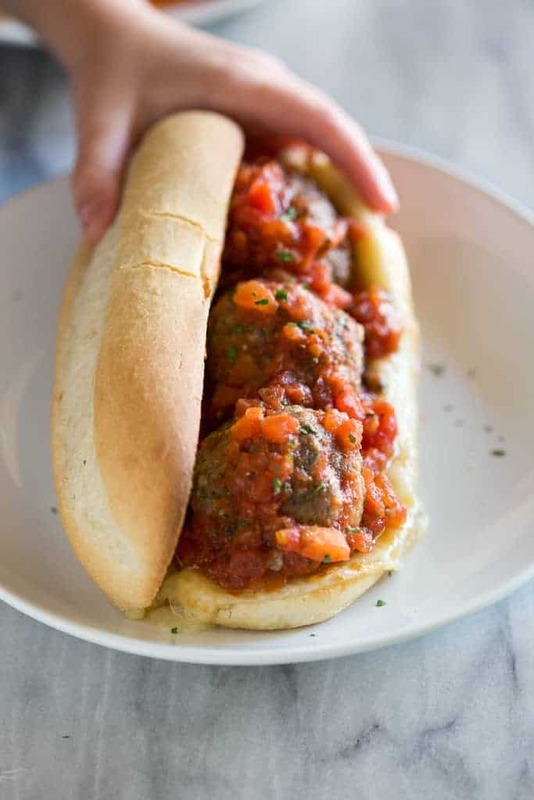 Easy Italian Meatball Subs with homemade meatballs, baked and topped with a simple Italian marinara sauce, served on a toasted hoagie with melted cheese! In a large bowl combine all of the meatball ingredients together EXCEPT for the meat. Stir and rest for 10 minutes so the crackers can soak up the liquid. Add the meat and mix just until combined (don't over mix). Preheat the oven to 400 degrees F. Line a baking sheet with parchment paper or foil. Form 15 meatballs, about the size of golf balls, and gently sprinkle them all around with flour. Place the meatballs one inch apart on the baking sheet and bake for 20 -25 minutes or until cooked through. While the meatballs cook, make the sauce. Add all of the sauce ingredients to a saucepan and stir to combine. Simmer for 10-15 minutes. When the meatballs are finished baking, scrape any grease off the bottom of them and place them in the sauce. Slice the hoagie rolls in half and layer with cheese. 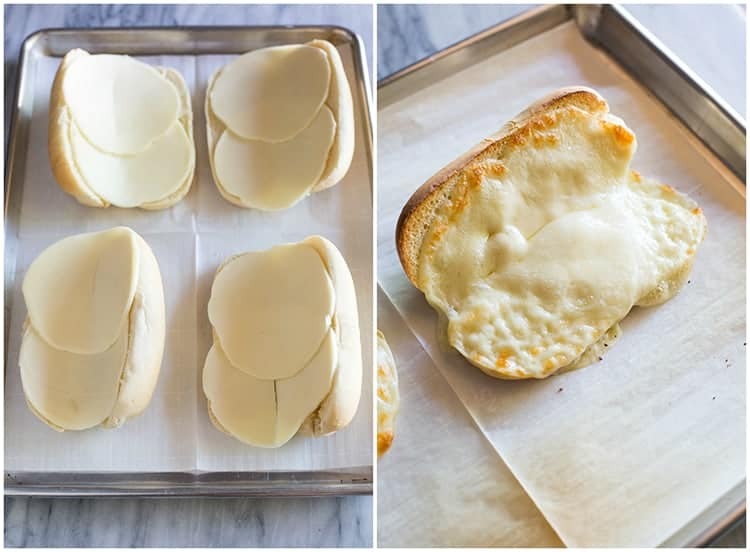 Broil on high for 2-3 minutes or until rolls are toasted and cheese is melted. Remove from oven. Place 3 meatballs on each sub, followed by a large spoonful of sauce. Serve immediately. *Tips for making ahead or freezing can be found above in the post. *I originally shared this recipe in June 2014. Updated April 2019. This is one of my families very favorite recipe! I have made them many many times! Just wanted to hop on and say THANK YOU! Last night my husband made fabulous fries in the deep fryer. We usually make oven chip roasties but we’ve had so much snow and so many storms that last night we needed ‘cabin fever’ comfort food so out came the deep fryer. Before we put the oil away, he said he was going to try homemade onion rings tonight. That got me thinking. He made amazing meatballs the other day with vegetarian ground round and I was thinking about how we could have them with the sure-to-be amazing onion rings. I’m going to get out the bread maker and whip up some buns and use a jar of marinara sauce that I canned using our wonderful garden tomatoes. I can’t wait for supper tonight. With the homemade marinara sauce (with memories of our summer garden and heat) and the snow blowing around outside right now, it will be like summer meets winter. Thanks for the great recipe idea. P.S. We both cook but my husband is fabulous in the kitchen. Made this for my family last night. It was amazing & not a drop left on any plate. I have already shared with friends. Wonderful!!!!!! Awesome! It is truly one of my favorites! Thanks for the great feedback!